Home » What's New » Are Nerf Guns a Dangerous Holiday Present? Nerf Guns: Popular, Projectile… Safe? With the newest Nerf guns and blasters reigning at the top of lists for the most popular toys this holiday season, many parents are excited to surprise their kids (or their spouses) with these coveted toy weapons. There is, in fact a whole culture behind these guns including a variety of themes, weaponry and ammunition, making finding the right Nerf gun for your loved one an additional part of the fun. Most don’t even bat an eye…(pun intended) about the possible dangers of these guns, specifically to the eyes and vision. The truth is, Nerf guns have been reported to cause eye injuries including corneal abrasion (or scratch on the eye), internal bleeding in and around the eye, pain, blurred vision, and temporary loss of vision. Blurry vision is sometimes due to swelling in the retina after a traumatic injury. Experts warn that they can cause irreversible damage to the eye such as a torn or detached retina and vision loss. So this, of course, begs the question: Are these a dangerous toy to buy for my loved ones? Well despite these troublesome facts, Hasbro, the company who manufactures the guns, claims that they go to extensive lengths to ensure the toys are safe. Based on years of research, consumer insights and rigorous testing, Hasbro assures that the toys “meet or exceed global standards and regulations” for safety. That is of course, when the toys are used properly and according to the recommended guidelines. So if, when used according to the guidelines, Nerf guns are not inherently dangerous, it is up to the parent’s discretion to assess whether they are a good choice for their family. Parents (or users of any age) need to establish proper rules and ensure that those using the guns are responsible enough to follow those rules. They should also do their part to be informed and understand the dangers and precautions necessary for safe use. If you do chose to purchase a Nerf gun, make sure that you do the research to ensure that you are selecting the best and safest model and accessories for your desired use. While most models are designed for children ages 8 and up, there are a few models that are specified for older children, so pay attention to the age recommendations. Do not allow children under the age limitations to play with the guns. Further, it is recommended that all children are supervised by adults during play. Nerf brand darts, blasters and foam rounds are made to meet strict safety regulations, while other brands that claim to be Nerf compatible may not be. Only Nerf brand bullets, designed for the specific product purchased should be used. In addition to other safety hazards, it has been seen that some bullets manufactured by other brands have a harder end which pose a greater threat for injury. Think about eye safety. Rule number one should always be: Never aim at anyone’s face or eyes. A direct hit to the eye can cause serious damage and pain. Ideally, the guns should be used with eye protection such as sports or protective goggles to prevent accidental eye injury, so think about adding a couple of pairs into the gift package. Never modify the guns, darts or blasters. There are many videos online that demonstrate how to modify the guns to shoot further, harder and faster. 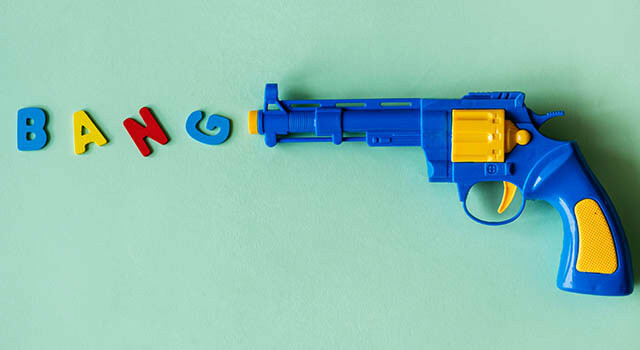 Tampering with the guns and ammunition in this way can undermine the safety measures built into the design of the toys and could result in more serious injury. Make sure to warn children against this as well. So, what’s the verdict? Whether or not Nerf guns are the right choice for your family depends on how responsible your family members can be with their use. Like many other toys and machinery, they can pose a danger when not used properly so anyone that is gifted or using this toy should be aware of those possible dangers, as well as the rules that are in place for eye safety. If you or a loved one does get injured by such a toy, get a medical evaluation immediately, especially if the injured person is experiencing blurred vision.